by ~ December 7th, 2009. Filed under: Poker theory. At the time that I’m writing this I’ve made a move from playing 8 tables of 25nl to 6 or 7 tables of 50nl. Not a big sample size at either level recently as I’ve played both levels multiple times in the past, but something over 6,000 hands of 25nl and 1,500 at 50nl in this sample, I think. I don’t often evaluate myself or my play according to various website rankings, but I did find something interesting here. This is myself at PokerTableRatings. 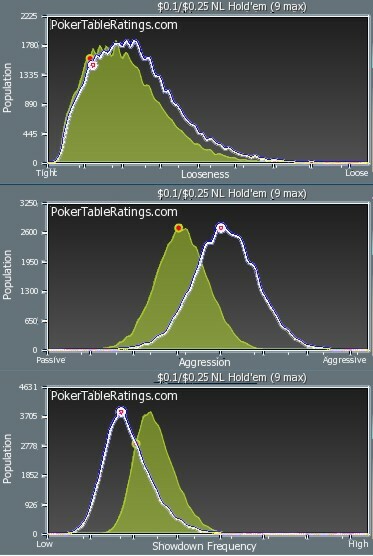 My situation relative to the entire sampled population is pretty much as I expect; on the tight side, mid aggression (btw, this is only at PokerStars but the population sample apparently is from all sites; the general population graph for my Full Tilt account is the same). What is more interesting is that I have overlaid the graphs from 50nl over top of the 25nl graphs. Green is the original 25nl graph and the white line is the overlaid 50nl graph. In my search for tables to play at 50nl it seemed that the tables were noticeably tighter. At 25nl I could find lots of tables were the number of player seeing the flop was over 30%, but at 50nl there were few. Maybe this just means there are way more tables running of 25nl, so there are more with 30% of the players seeing the flop? The graphs are indicating that overall the preflop looseness changes very little, maybe even shifts slight towards being more loose, but note how the aggression level makes a significant shift to more aggressive, and showdown shifts toward tighter. Again, my own results are not statistically significant, but I do like the fact that I appear to have adapted my aggression and showdown with the change in level. Those are not statistics that I track regularly so I wasn’t even aware that my aggression was higher or that my showdown rate was lower at 50nl than 25nl. Edit: I didn’t notice that the markers on the x-axis are spreading in the overlaid graph, indicating to me now that the graph is stretching the x-axis, so both the aggression and showdown frequency are not shifting as much as seemed to shift.